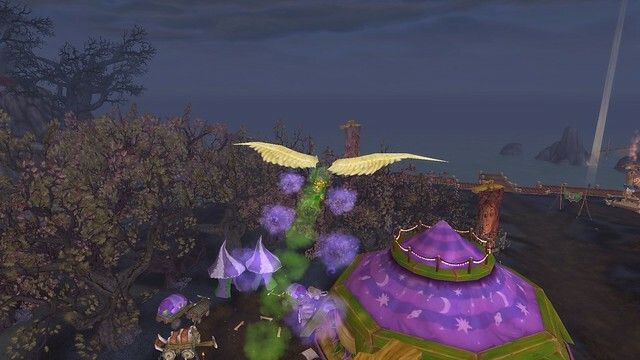 During the Darkmoon Faire, one of the games, as you know, is to be shot out of a cannon. There's an achievement if you can hit the target smack dab in the middle. The Darkmoon Faire can provide a large number of selfie opportunities, with its Mardi Gras theme and nooks and crannies. But one thing you can't do is take a selfie when you're shot out of the cannon. I see why. When you're in the air, you control when the wings release on your kite. This allows you to hit the target based on your perception of where you are relative to the target. It's rare that I score a bullseye anymore. I was never a good judge of where I am relative to where I need to be. The buttons for releasing the kite occupy the same buttons used for the selfie camera. There would have to be additional coding in order to have one or the other shift. I would say, shift the camera buttons since that was added a long time after the faire. I think this is an egregious oversight on Blizzard's part. The look on a toon's face could be priceless and the potential for selfies enormous. But, as with other ideas we've had, it would require some coding that could be dedicated to other areas such as fixing things that don't work. On a side note, you can't take selfies when you're falling, even if you're falling a very long distance. Yes, we would be the guild that has tried it.